The exhibition versus should be on your short list of shows to visit in New York City between now and March 8. Curator/collector/artist/bloggerRuben Natal-San Miguel has assembled an eye-popping array of images by some of contemporary photography’s most intriguing artists. The list of 18 participating photographers is indeed impressive, including some well-known names, such as Zoe Strauss, Michael Wolf, Brian Ulrich, Mickalene Thomas, Eric Ogden, and Hank Willis Thomas, among others. More interestingly, San-Miguel has paired these more high-profile artists with those who may be a little less familiar to you, at least for now. These pairings, from which the show garners its name, are a simple device that accomplishes a lot with elegant economy. 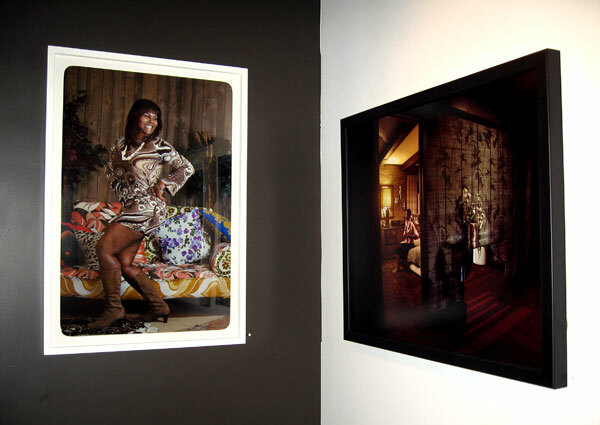 In most cases, such as putting Mickalene Thomas’swork together with Nadine Rovner’s, the pairings amplify similarities in theme and approach, in this case, a retro seventies feel concerned with sleekness, glamour, and its impact on identity and narrative. When curator san-Miguel poses the question, “If it wasn’t Penelope Cruz peeking through the window, if it was Jane Doe, would the scene be as powerful, lush, and tantalizing?” about Ogden’s work, placing Jen Davis’s images next to Ogden’s answers with a resounding “Yes!” Sometimes the juxtapositions presented in versus are so refined that you may have to squint to tell where one photographer’s work stops and another’s begin, such as with Phil Toledano vs. Elizabeth Fleming. Versus takes on additional complexity when work by “unpaired” photographers start to speak to each other from across the room. This synergy happens best when the deserted, signless storefront in Brian Ulrich’s Toys-R-Usreverberates with the erased-logo mints tin in Hank Willis Thomas’s Now That’s Funny; these connections between unpaired works form the connective tissue that holds the whole exhibition together as a survey. Ultimately, versus is an exhibition about relationships both on the walls and beyond them. The backstory of how the show was conceived, put together, and promoted provides a great case in point. That versus was conceived of, organized, and then promoted on Andy Adam’s Flak Photo website in a matter of weeks is a testament to the strength of the connections among the many players. The quality and richness of versus is proof that hous projects and Ruben Natal-San Miguel really know how to put on a show. Those who can’t visit versus in person can get a flavor of what it has to offer at the hous projects website. —Mary Goodwin is the Associate Director at Light Work in Syracuse, New York. Light Work was founded in 1973 as a non-profit, artist-run organization. We provide direct support to artists working in the media of photography and digital imaging through residencies, publications, exhibitions, a community-access digital lab facility, and other related projects.